← Not the Highline but the Coal Line? 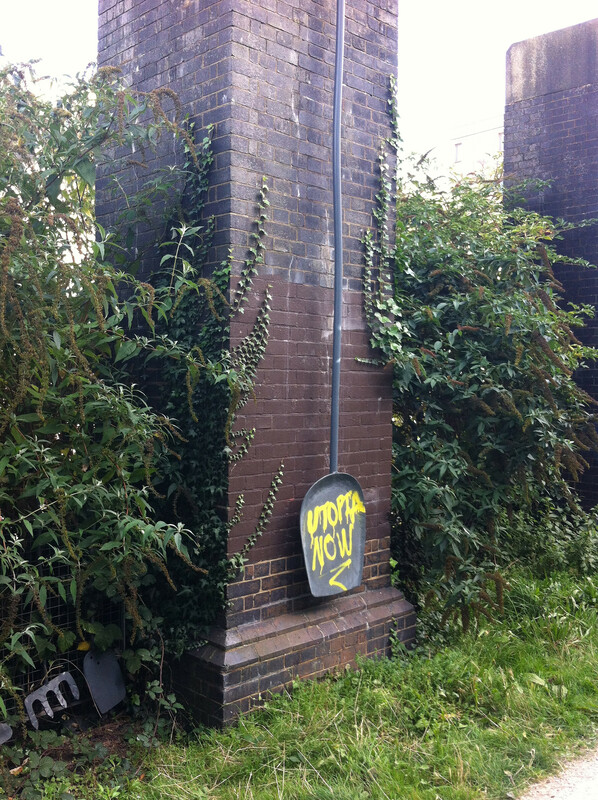 Though some of us sympathise with the sentiment behind ‘Utopia Now’, there’s no denying that the tagging up on Brighton Greenway is just plain sad and ugly when it undermines public art and ignores commemoration of the site’s industrial heritage. These brick pillars are part of Brighton’s Victorian locomotive works, a neglected part of Brighton’s industrial heritage which needs to the celebrated. Good ghosts of railway workers and locomotive engineers inhabit the Greenway. Jon Mills’ ‘tools’ adorning the fence and the pillars reference the clinker shovels used by locomotive firemen in the days of steam. 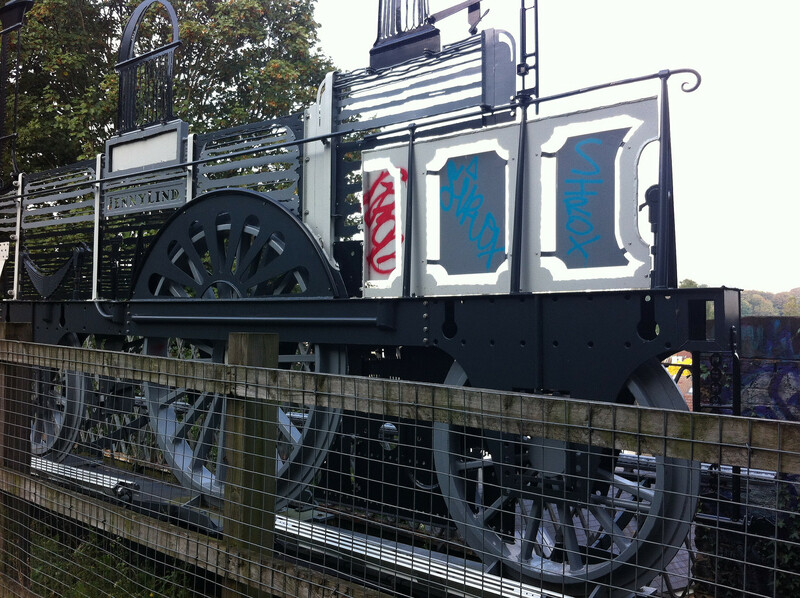 It’s sad to see tagging already on Jon’s ‘Jenny Lind’ Ghost Train sculpture, celebrating the class of locomotive most associated with the pioneering days of the London Brighton and South Coast Railway. Rachel Reynolds’ elegant chalky seating with fossil imprints suggests continuity with prehistoric wildlife but these structures are constantly tagged so it’s easy not to notice the fossil features. 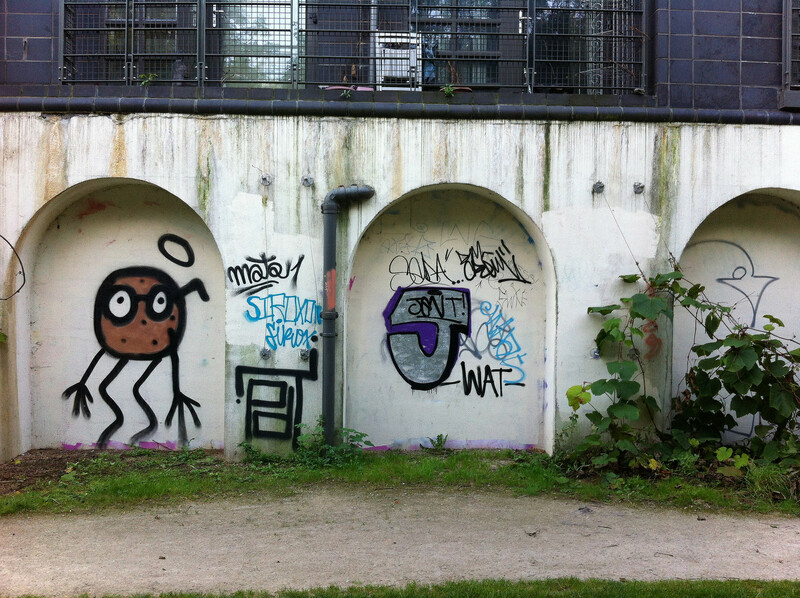 The arches of the west wall are also badly graffiti’d, though we’ve grown fond of the saintly bug. These arches are again part of the original Victorian buildings which made up the Locomotive Works. It would be great to see these alcoves being transformed into an outdoor art gallery, with changing images which evoke the very special ‘sense of space’ of Brighton Greenway. 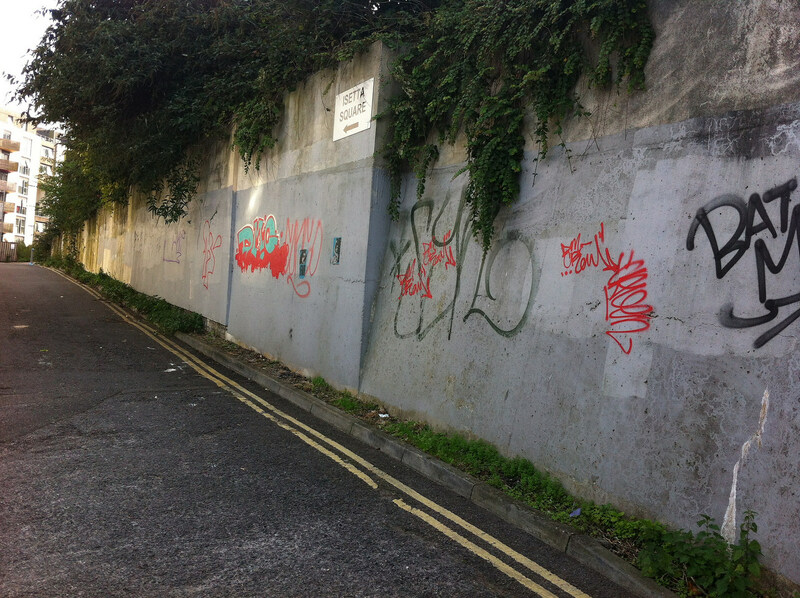 And finally, this long wall on the west side of Boston Street, leading up to the Greenway, is just crying out for images of trains, maybe also bubble cars (if you don’t know the ‘Isetta’ reference, see our Presentations on the Documents page), perhaps representations of William Stroudley and Robert Billinton, great Brighton locomotive engineers whose names now figure on nearby streets, and the railway workers who lived in this area? The intriguing lift, which will shortly transport people and bikes from the station concourse to Fleet Street, is covered in the stereotypical ‘images of Brighton’: the beach, Victorian bathing machines and the seafront but sadly, these are not images that reflect the railway heritage site. 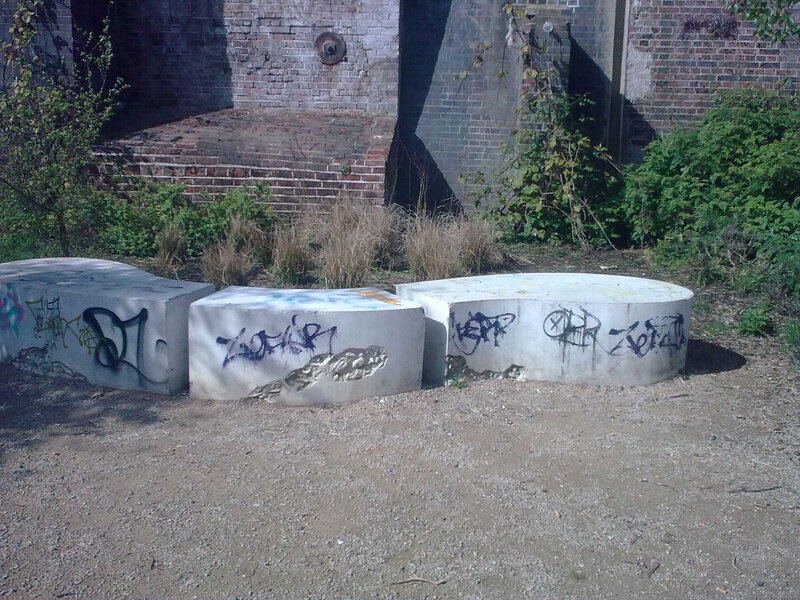 Perhaps we can redress the balance by promoting some street art along the Greenway which acknowledges those ‘ghosts’ – the wildlife we often don’t see, and the railway workers and engineers who haunt the space. We discussed solutions to graffiti on Brighton Greenway at our recent meeting (3/11/15). If you’d like to find out more, see the minutes for that meeting and also the document and photos produced by Simon Bannister, BHCC – available on the Documents page.